A total of 10 new places from across the country, including Yamunotri and Gangotri, have been included in the second phase of Prime Minister Narendra Modi’s favourite Swachh Bharat Mission. These iconic places, which are to be brought to a higher standard of cleanliness and in terms of amenities for visitors, are Gangotri, Yamunotri, Mahakaleshwar Temple, Ujjain, Char Minar, Hyderabad, Church and Convent of St. Francis of Assissi, Goa, Adi Shankaracharya’s abode Kaladi in Ernakulam, Gomateshwar in Shravanbelgola, Baijnath Dham, Devghar, Gaya Tirth in Bihar and Somnath temple in Gujarat. 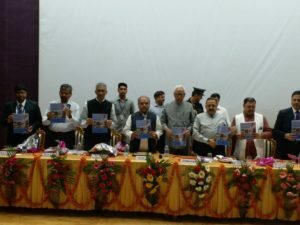 This was announced in the second quarter review meeting of Swachh iconic places held at Mata Vaishno Devi Shrine, in Katra, Jammu and Kashmir. The country has made fast and remarkable progress with sanitation coverage increasing to 64% with 1.92 lakh villages becoming Open Defecation Free (ODF). The Jammu and Kashmir (J&K) state government also declared Reasi as the ODF block of J&K at the event. The meeting was attended by the Governor of Jammu & Kashmir, N N Vohra, Union Minister for Rural Development, Panchayati Raj and Drinking Water and Sanitation, Narendra Singh Tomar; Union Minister of State, Dr. Jitendra Singh; among others. At this occasion, Tomar also inaugurated two water ATMs at Katra town. A reverse vending machine was also launched at the event.